(ax − b)(ax + b). (x − 1)2 = x2 − 2x + 1.
square to solve a quadratic equation . 4. Take half the coefficient of the x term, square it and add it to both sides of the equation. get: x2 + 2x + 1 = 3 + 1. Step 3 : Check that the coefficient of the x2 term is 1. The coefficient of the x2 term is 1. 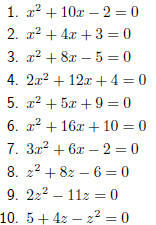 Compare to answer in step 7.